In the ongoing fight for sexual equality, discourse and translation are key mechanisms, that deserve careful scrutiny. This chapter describes a teaching experience within my Legal Translation (English–Spanish) module at the University of Valencia. Students were required to translate some passages from Sycamore Row (2013), a best-selling legal thriller by John Grisham. In class, we analyzed and discussed these passages and compared them with the students’ translations as well as with the 2014commercial Spanish version, entitled La herencia. Sexist and/or patronizing comments are common in this book, disguised under the veil of irony or humour. Thus, John Grisham manages—through humour and irony—to portray women as unprofessional in the legal field, as dangerous objects of men’s desire, as a source of danger and trouble, and so on. 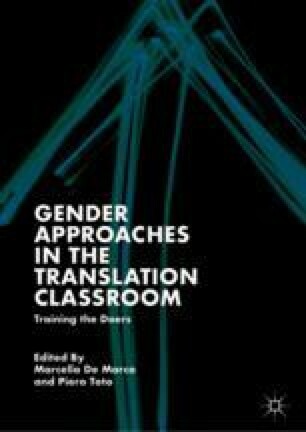 Translation as a didactic tool can be used to interrogate not only the linguistic structures of the original, but also its (androcentric) logic; in this respect, both feminist translation strategies (Flotow, 1991; Massardier-Kenney, 1997) and a feminist pedagogy (Ergun and Castro 2017) will be most useful.